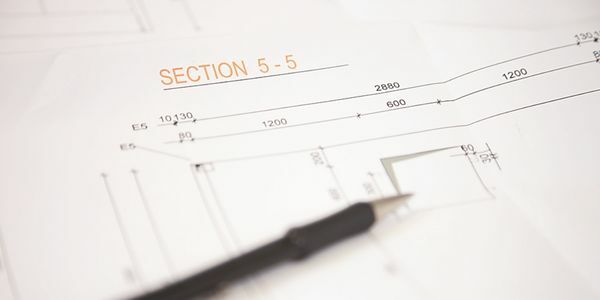 Below you find a selection of published articles and project reports from different media. 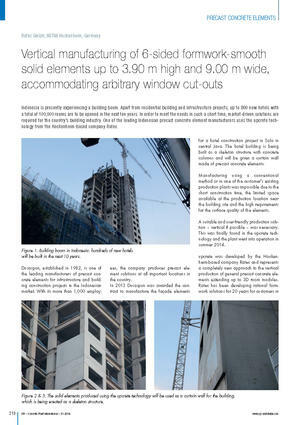 Initiated by customer requirements and in close collaboration with Reymann Technik's planning department, Ratec's first developments and trials with volumetric formwork for room modules began in the beginning of the century. In the meantime, the company has responded to current market requirements and significantly expanded its product range in the area of 3D formwork. The construction industry in South America differs greatly from country to country. 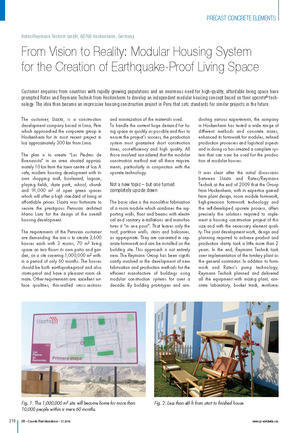 However, the need for living space – and above all affordable living space – is present everywhere and is growing. 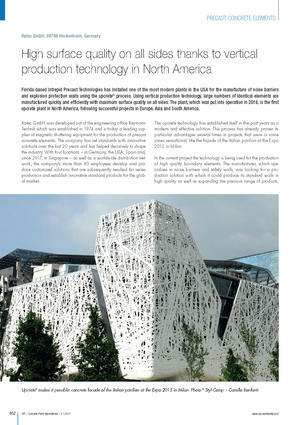 Innovative, practice-proven production technology for the precast sector is therefore growing in importance. 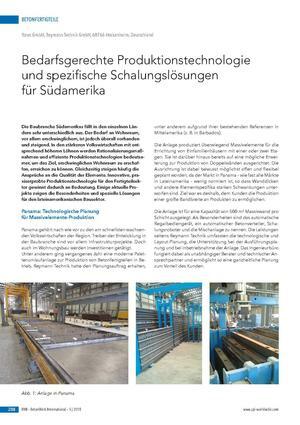 Several current projects demonstrate the unique features and special solutions for the Latin American construction sector. With the further development of formwork solutions for precast concrete element production, especially for volumetric elements (e.g. room modules), intelligence solutions for filling these formworks are required to enable high surface quality and efficient production. In addition to its formwork solutions, Ratec has developed a practical pumping technology for filling closed formworks that is specifically tailored to the requirements of the precast plant. 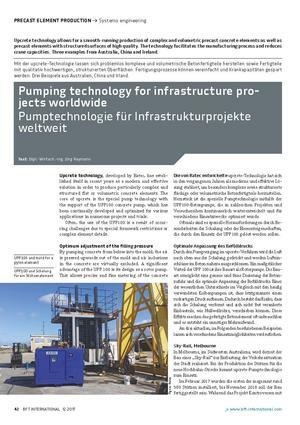 Two project examples from the recent past illustrate different Ratec pumping technology application possibilities in precast concrete element production. 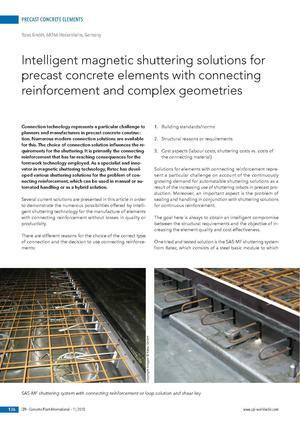 Connection technology represents a particular challenge to planners and manufacturers in precast concrete construction. for the shuttering. 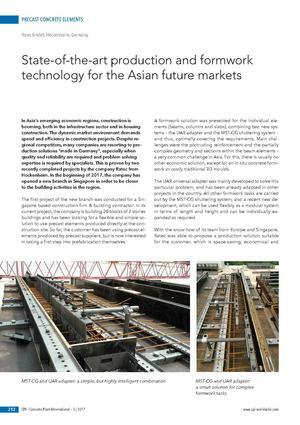 It is primarily the connecting reinforcement that has far-reaching consequences for the formwork technology employed. 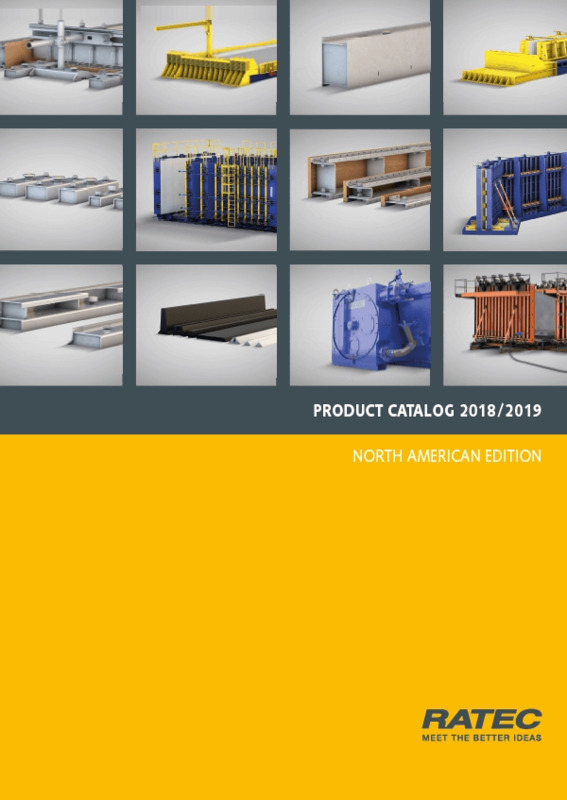 As a specialist and innovator in magnetic shuttering technology, Ratec has developed various shuttering solutions for the problem of connecting reinforcement, which can be used in manual or automated handling or as a hybrid solution. 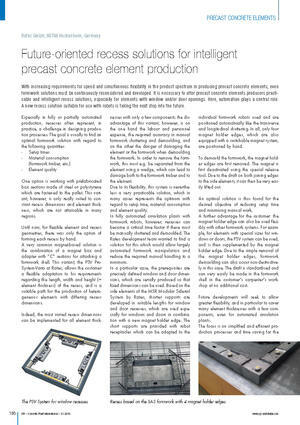 precast elements with structured surfaces of high quality. The technology facilitates the manufacturing process and reduces crane capacities. Three examples from Australia, China and Ireland give an outline of different fields of applications. In Asia's emerging economic regions, construction is booming, both in the infrastructure sector and in housing construction. This is proven by two recently completed projects by the company Ratec from Hockenheim. In 2016, the first upcrete® production plant was installed in North America. More details can be found in the article published by CPI in April 2017. 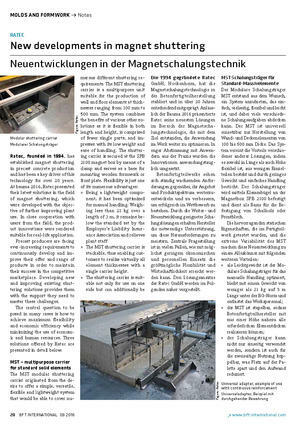 At bauma 2016, Ratec presented their latest solutions in the field of magnet shuttering, which were developed with the objective of further improving plant use. The Rome-based architect's office Nemesi & Partners designed the Italian Pavillon Palazzo Italia for the Expo 2015 world exhibition in Milan with a façade that is equally good-looking and pragmatic. 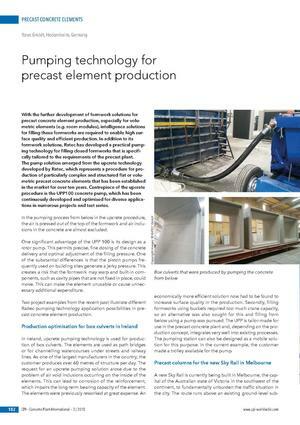 The majority of the facade elements were produced in specially manufactured battery moulds using the upcrete technology from Ratec. 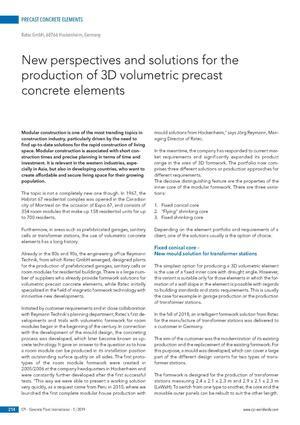 With increasing requirements for speed and simultaneous flexibility in the product spectrum in producing precast concrete elements, even formwork solutions must be continuously reconsidered and developed. It is necessary to offer precast concrete elements producers practicable and intelligent recess solutions, especially for elements with window and/or door openings. Here, automation plays a central role. A new recess solution suitable for use with robots is taking the next step into the future. 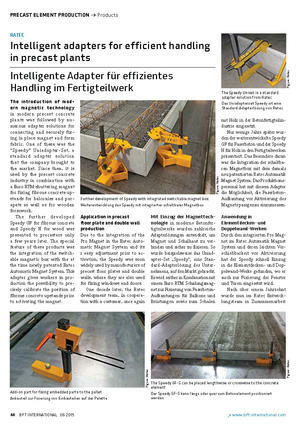 The introduction of modern magnetic formwork technology in modern precast concrete plants was followed by numerous adapter solutions for connecting and securely fixing in place magnet and shuttering skin. RATEC has decisively contributed to the development of industry standards. 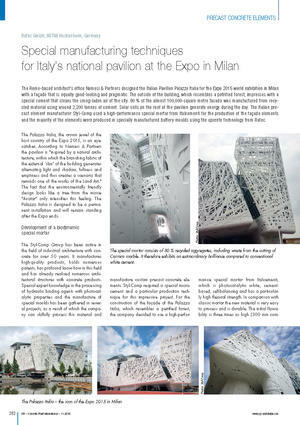 Now, one of its "classics" was further developed to comply with increasing demands in precast plants. from the Hockenheim-based company Ratec. 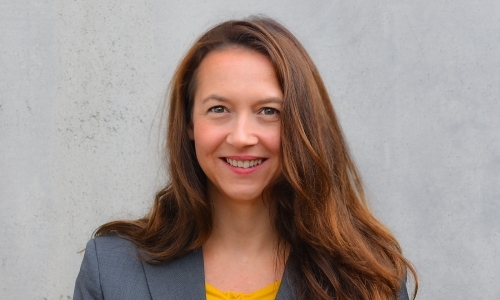 Customer enquiries from countries with rapidly growing populations and an enormous need for high-quality, affordable living space have prompted Ratec and Reymann Technik from Hockenheim to develop an independent modular housing concept based on their upcrete® technology. The idea then became an impressive housing construction project in Peru that sets standards for similar projects in the future.